Obesity in cats is not a joke. It's an extremely serious condition that leads to all kinds of health disorders, including a potentially fatal condition called hepatic lipidosis (fatty liver disease), diabetes, nonallergic skin conditions, and even urinary tract disorders. Just as important is the effect that obesity has on the ability of a cat to be catlike. As carnivores, cats naturally use stealth and speed to outrun and capture their prey. An overweight cat is sluggish, weighted down, and she simply cannot partake of her most basic, instinctive behavior. Yes, some cats are just more naturally active than others. But a fat cat has no choice. Imagine you're a human whose healthy weight is roughly 120 pounds. And imagine that your most beloved activity--the thing that makes you you--is to run marathons or take long swims or hikes. Then imagine that every day, you are forced to carry around another 40 or 50 or 60 pounds. You're compelled to do this because the person that has 100 percent control over everything you eat is feeding you a food that makes you carry more and more weight with each passing year. You feel tired, sluggish, and it's just too much for your joints, your heart, and your lungs to do much more than sit around all day. And imagine that on top of this, you can't bathe yourself as you'd like. Your skin itches, your blood sugar runs amok putting you at serious risk for diabetes if you don't already have it, and you are at risk for other life-threatening health troubles including urinary disorders. That is what life is like for an overweight cat. It's not a pretty picture, is it? Reducing or eliminating carbohydrates--a good idea for any carnivore, overweight or not--is absolutely essential for safe and lasting weight loss. That is why there is no way to safely reduce an obese cat's weight using a diet that contains any dry food. Ever. Dry food doesn't help a cat safely lose weight and never will. Dr. Jean Hofve hits the nail on the head in her insightful article on feline obesity, observing that dry food is "actually where the most dangerous calories are." The cat, she notes, "is uniquely adapted to get energy from protein and fat; the cat's natural prey contain very little carbohydrate. For most cats, carbohydrates are converted to fat, rather than be burned for energy. Clearly, this is the opposite of where we want to go!" Dr. Hofve, by the way, has done cat caregivers a magnificently generous favor by maintaining a wonderful, free, online library that is packed with short, easy-to-understand essays on a wide variety of feline health, nutrition, and behavior issues. If you haven't already perused that site, I strongly suggest bookmarking it and keeping it handy for future reference. It's not simply a matter of cutting calories or reducing fat. The concern about doing grave harm to an obese cat by cutting calories and allowing them to skip too many meals is echoed in Dr. Hofve's article, which notes that "dieting" to reduce calories "may cause even worse problems, such as life-threatening liver disease. Skipping a single meal can throw a sensitive cat into a serious problem." The message couldn't be clearer. When it comes to obesity in cats? It's the carbohydrates that are the culprit. According to a November 2004 article in Medical News Today summarizing a study funded by the Morris Animal Foundation, Drs. Deborah Greco and Mark Peterson--staff endocrinologists at The Animal Medical Center in New York-- demonstrated that feline diabetes, caused by too much fat, occurs most often in obese cats. Most importantly, the results of the study showed that diabetic cats on the "Catkins" diet often can ditch daily insulin shots altogether. So? Getting an obese cat to safely lose weight is not only critical to keeping your cat feeling well and cat-like, but is critical to help avoid a costly and miserable malady like diabetes. The same Medical News Today article observed that the traditional approach of giving diabetic cats a high-fiber diet to help them lose weight may help the cats lose fat, but the animals also lose muscle. A far more sane choice is a low-carbohydrate/high-protein diet. Patients at The Animal Medical Center and Colorado State University participated in a clinical trial and of the cats on the high-protein diet, a remarkable 68 percent went off insulin. Dr. Greco noted that the high-protein fare worked best because it is similar to what cats in the wild would eat. Again? Common sense prevails. Using Mother Nature as a guide is the wisest way to approach dealing with all kinds of feline ailments. "The thing that convinced me that this was the right diet was the improved quality of life for these cats," Dr. Greco says. "They became kittens again." Okay, so just for kicks, let's look at the nutritional breakdown of a mouse carcass--something that is akin to the food that oh-so-wise Mother Nature intended for carnivores. A mouse carcass is about three percent carbohydrate. Dry cat food? It has between 35 and 50 percent carbohydrates. And what happens if you feed a cat more carbohydrates than she was anatomically designed to eat? Dietary carbohydrate that is not used for energy is stored as fat. It doesn't take a degree in nutrition to figure out that if you put an obligate carnivore on a high-carbohydrate diet, she is going to become obese more easily than a cat on a low-carbohydrate diet. On her lovely website, Dr. Lisa Pierson says it more succinctly than I ever could: "Carbohydrates are minimally used for energy and those that are not used are converted to and stored as fat. The so called 'light' diets that are on the market have targeted the fat content as the nutrient to be decreased, but in doing so, the pet food manufacturers have increased the grain fraction, leading to a higher level of carbohydrates. Hence, many overweight cats eating these diets are still obese. These 'light' diets are among the most species-inappropriate, unhealthy diets available to cat caretakers. Many caretakers feed very small amounts of these diets hoping that their cat will lose weight but feeding a small amount of a diet that is inappropriate for the species is NOT the answer! The caretaker simply ends up with a crabby, overweight cat." So? What should you feed? If you've already spent any time looking at the other parts of my website, it will come as no surprise that I think a home-prepared, balanced, grain-free raw diet like the one I recommend on this site is the very best way to go. Or you could purchase a truly quality pre-made raw diet that contains no grains or vegetables. Cats are carnivores. They have simple stomachs that are made to digest meat--not grains or vegetables. They don't have salivary amylase to break down plant matter in their mouth. And look at the beautiful teeth of a cat! Those lovely, sharp, prominent canines are there for stabbing. The entire structure of a cat's mouth is designed to shear off chunks of meat and swallow it whole. Those raspy tongues can lick the meat off of bones. Instead of grinding molars that move back and forth, a cat has carnassial back teeth that act like scissors to slice off flesh. Look at the pads of your cat's feet. They are ringed with fur because Mother Nature designed her to stalk silently and come closer to her prey. Her whiskers allow her to move confidently in darkness and guide her to the nape of the neck for a killing bite. Cats are carnivores. And getting your cat on the diet nature intended is the finest way to get her back to her true, svelte, self. Feeding her carbohydrate-heavy, meat-flavored cereal will keep her fat and abbreviate the quality and quantity of her life. If you're not willing or able to make a home-prepared diet, then please safely wean your cat your cat off of all dry food and move her on to a quality canned food that has minimal or no grains. Once she's eating a good canned food, don't give her dry food again. If you have a devoted and stubborn dry food addict on your hands, the first thing to do is to stop free-feeding kibble. This is absolutely essential. Having food available 24/7 is NOT a good idea for any cat, and if your cat has constant access to that food, you'll have a very hard time getting her weaned onto a healthier, low-carbohydrate, moist, high-protein canned food. One way to approach this is to offer two or three meals a day of a very small amount of dry food (perhaps 1/8 to 1/4 of a cup) and, after 30 minutes, take up the food she hasn't eaten. Then do not give in if she pleads for a between-meal snack. You want your cat to get accustomed to eating on a schedule this way--at mealtimes. You MUST stop free-feeding dry food. Next, after you've established set meal times for a few days or a week, begin setting out meals of ONLY good canned food. If your cat refuses to touch it, take up the food and try again a few hours later. Yes, it takes some patience to get a cat off of dry food and onto something healthier, but think how much time it would take if your cat develops diabetes or some other disease and you're forced to spend time, money, and energy coping with that. If, after 18 hours or so, your cat still has refused canned food, then offer them a tiny bit of dry food--about a tablespoon. At this point, you may have to try serving another kind of canned food to see if she'll try that. Another trick is to generously sprinkle some of the crushed dry food onto a quarter cup of the canned food and offer that and then, over a period of two to three days, start using less and less of the crushed kibble and more and more of the canned. You will be the best judge of how quickly to do this, based on how your cat is adapting. Another trick is to dip some of the dry food into the 'juice' of canned food to begin to accustom her taste buds to the taste of the better food. The idea here is simple and tricky at the same time. You want to get your cat moved on to a good, preferably grainless, canned food as quickly as possible, but you do not want to starve her into submission and risk hepatic lipidosis by permitting her to go without any food whatsoever for longer than 18 to 24 hours. It's not very safe to let an overweight cat go longer than 24 hours without food. Hepatic lipidosis becomes a serious concern once an overweight cat has gone without food for 48 hours. Hepatic lipidosis is a condition in which fat accumulates in individual liver cells and is a real risk for overweight cats that stop eating altogether. Without food, the body starts sending fat cells over to the liver to process lipoproteins for fuel. Lipoproteins are composed of a simple protein and a fat component that carry fats in the blood. Left untreated, the liver can fail and the cat can die. The veterinary l iterature suggests that about 70 percent of cats will recover from hepatic lipidosis if they are hospitalized and fed via tube feedings. Who wants to put their cat through that? No one. So, again, remember that starving an overweight cat is not an option. They cannot 'live off their fat.' Their fat, in fact, can kill them. So be mindful of this as you approach a sensible weight loss program for your fat cat. Ideally, your feline weight loss client should eat at least a little something every 12 hours. It really is okay to let her go 12 hours without food; hopefully a bit of hunger will help as an incentive to get her to eat healthier, non-dry, food. Once she is successfully switched over to a high-protein, low-carbohydrate diet and is off of all dry food, then begin to feed her two to three small meals of canned food a day. Remember, even the worst canned food is better than dry food, because it will invariably be lower in carbohydrates and have much more moisture in it. The water in canned food is not a wasted, useless, filler that's only there to take up space. It's insurance that a cat is getting her moisture with her food, as nature intended. A cat eating dry food, even if she is drinking supplemental water, still has roughly only half the water intake of a cat eating canned food. One of the most heartwarming stories I've heard is of a very lovely, gentle, sweet cat named Molly. When she first arrived in her foster home, Molly was grotesquely overweight. Her previous 'caregiver' had tried using "portion control" with dry food--and even a shock collar--to get Molly to eat less of her dry food and lose weight. These approaches, naturally, didn't work. Poor Molly could hardly walk carrying around all that extra weight. She had terrible dandruff and could not even manage to keep her back end clean. We know how naturally fastidious a cat is about personal hygiene. Just imagine how awful it is for a cat that is unable to clean herself. She couldn't run. Heck she could barely move. Her foster caregiver -- Dr. Lisa Pierson as luck would have it--pulled out all the stops for Molly. She took away the dry food and started her on a 'tough love' program to get her eating only a grain-free canned food. And it wasn't easy. Molly's metabolism was a mess and she simply refused her food. Because her condition put her at serious risk of hepatic lipidosis and because Dr. Pierson was well-versed and had the skills, she safely syringe-fed Molly a good canned food, and continued feeding her that way for a time so she could start getting regular, nutritious meals. After that, Molly slowly started showing an interest in food again. Slowly, steadily, over time, Molly's weight began to drop--and it continued. She lost weight eating 5.5 ounces each day of a good quality grainless canned food. Once Molly was on the right track, Dr. Pierson found her a loving home with a very devoted and committed caregiver who understands how important it is to keep her off all dry food, and ensure she continues to eat only the grainless, canned food that helped her begin to drop all that terrible extra, unhealthy weight that the poor sweetheart had been carrying.
. . . and Molly after, well on her way to her appropriate weight. 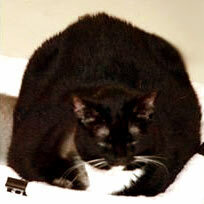 When she started at Dr. Pierson's Fat Camp for Wayward Cats, Molly weighed over 20 pounds. Five and a half months later, Molly weighed around 16 pounds. A few months after that--under the loving eye of her new caregiver who stuck with the grain-free diet and has kept Molly away from all that fattening and dangerous dry food--Molly weighed in at under 15 pounds. This means that since beginning her weight loss program, she safely lost over 26 percent of her body weight. She is now well on the way to being the correct size for her frame. For the first time in ages, she can clean herself. Her coat is sleek, silky, and altogether lovely. And the happiest news of all is that her new caregiver reports that Molly is running and jumping again. She can even stand on her hind legs. Molly was able to be a real cat again.